Background We previously showed that the presence of a CKD-associated locus in SHROOM3 in a donor kidney results in increased expression of SHROOM3 (an F-actin–binding protein important for epithelial morphogenesis, via rho-kinase [ROCK] binding); this facilitates TGF-b signaling and allograft fibrosis. However, other evidence suggests Shroom3 may have a protective role in glomerular development. Methods We used human data, Shroom3 knockdown podocytes, and inducible shRNA-mediated knockdown mice to study the role of Shroom3 in adult glomeruli. Results Expression data from the Nephroseq database showed glomerular and nonglomerular SHROOM3 had opposing associations with renal function in CKD biopsy samples. In human allografts, homozygosity at rs17319721, the SHROOM3 locus linked with lower GFR, was associated with reduced albuminuria by 2 years after transplant. Although our previous data showed reduced renal fibrosis with tubular Shroom3 knockdown, this study found that glomerular but not tubular Shroom3 knockdown induced albuminuria. Electron microscopy revealed diffuse foot process effacement, and glomerular RNA-sequencing showed enrichment of tyrosine kinase signaling and podocyte actin cytoskeleton pathways in knockdown mice. Screening SHROOM3-interacting proteins identified FYN (a src-kinase) as a candidate.We confirmed the interaction of endogenous SHROOM3 with FYN in human podocytes via a critical Src homology 3–binding domain, distinct from its ROCK-binding domain. 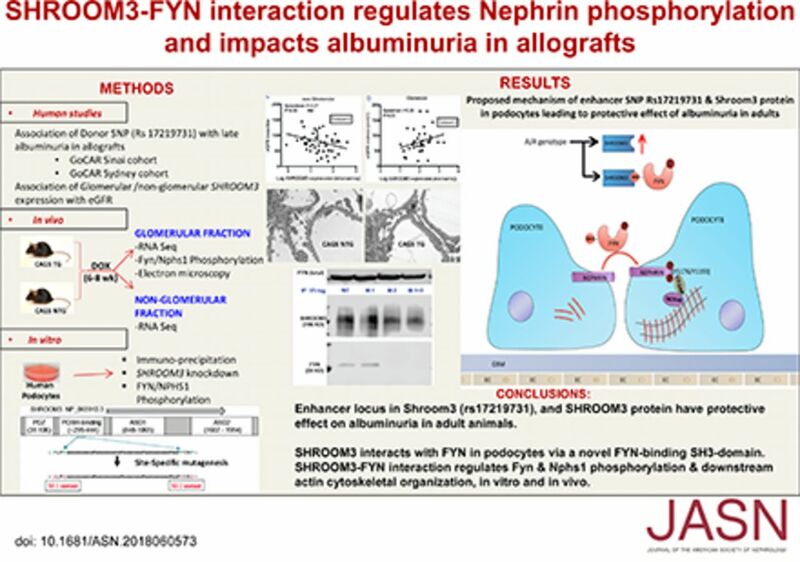 Shroom3-Fyn interaction was required in vitro and in vivo for activation of Fyn kinase and downstream nephrin phosphorylation in podocytes. SHROOM3 knockdown altered podocyte morphology, cytoskeleton, adhesion, and migration.